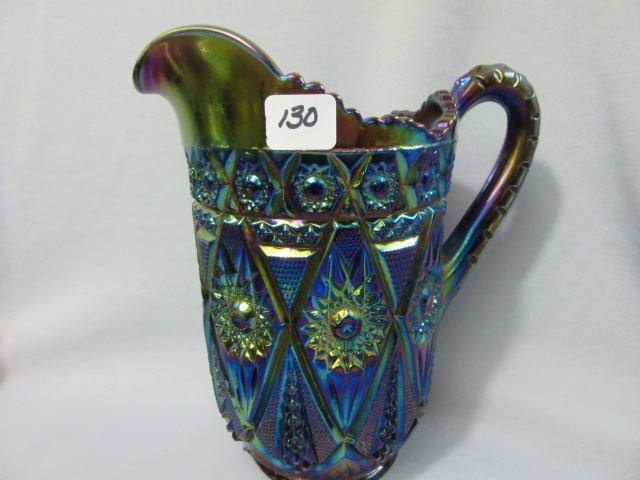 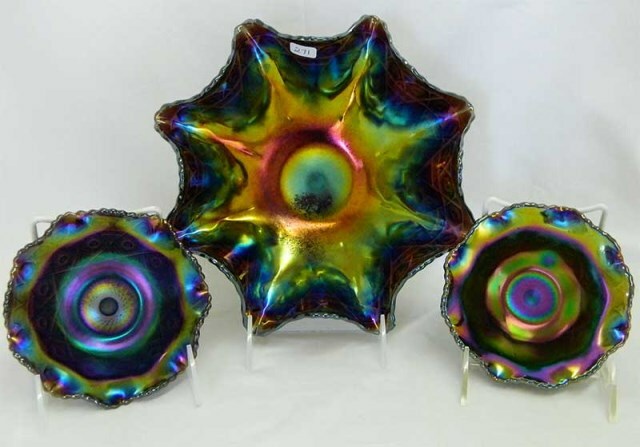 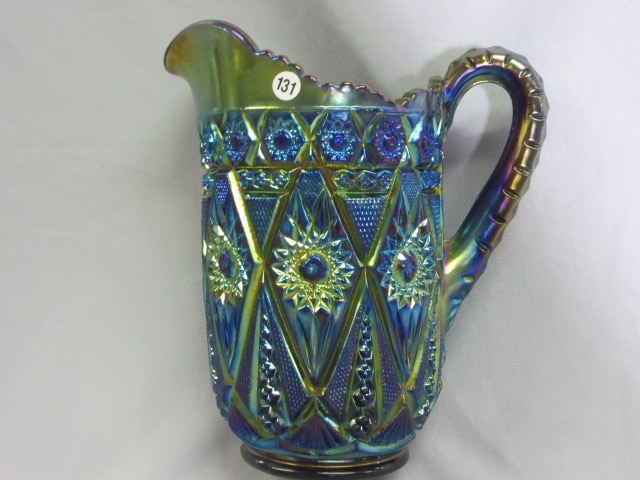 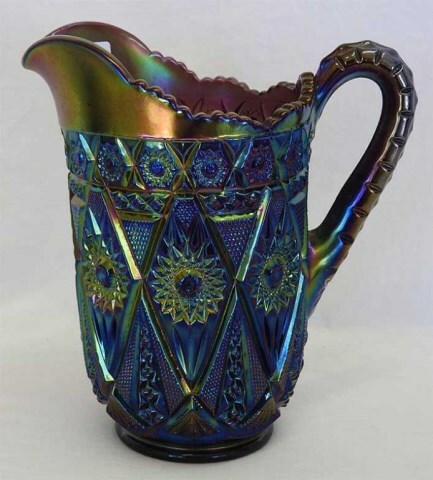 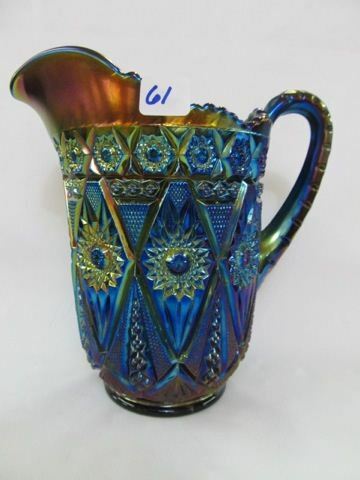 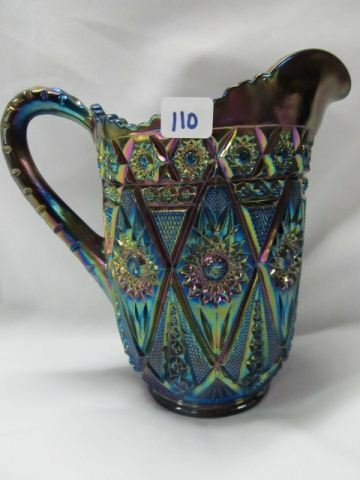 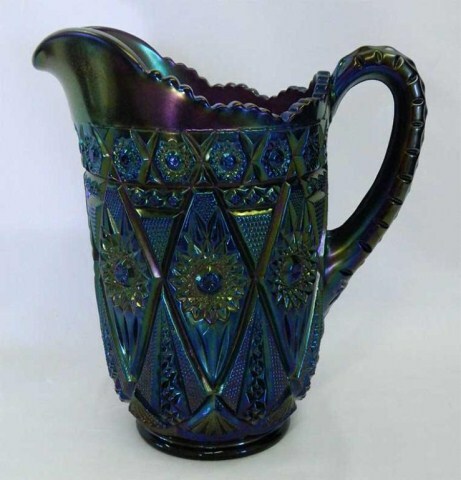 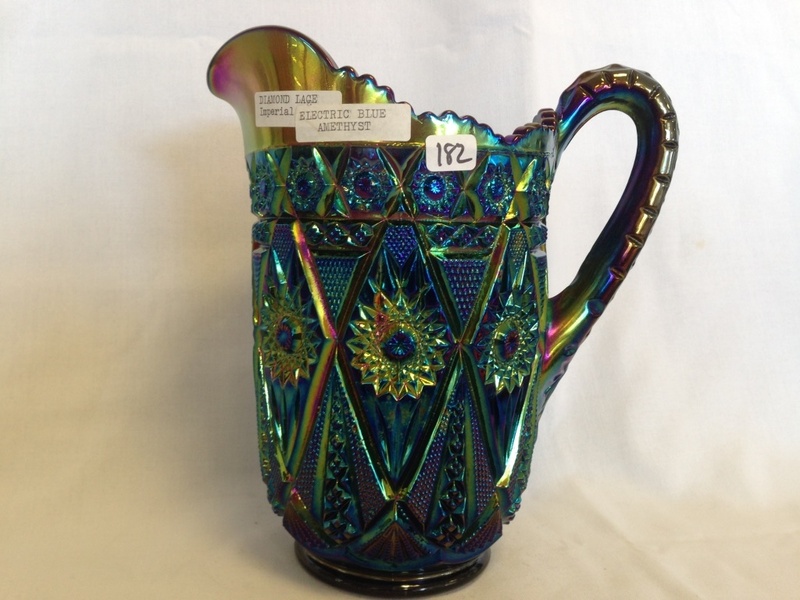 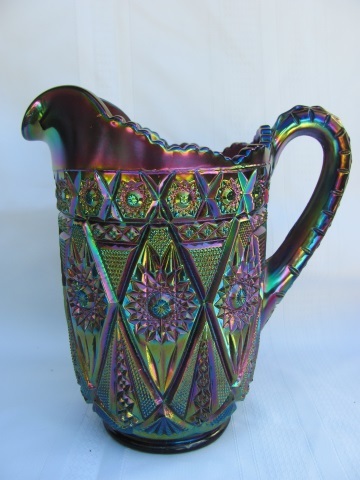 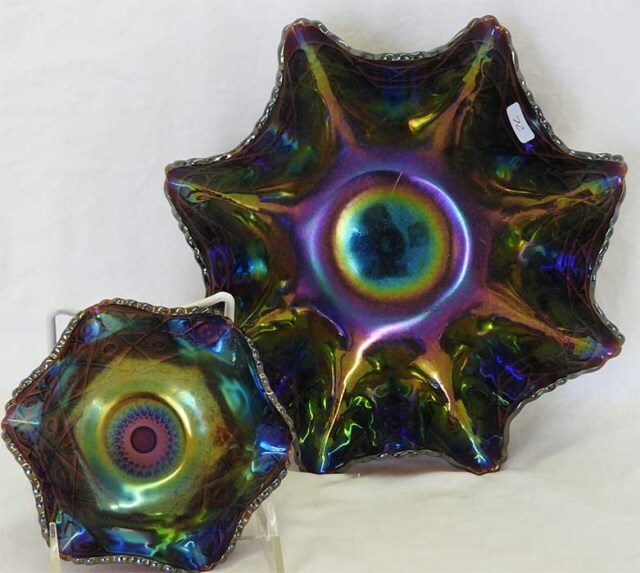 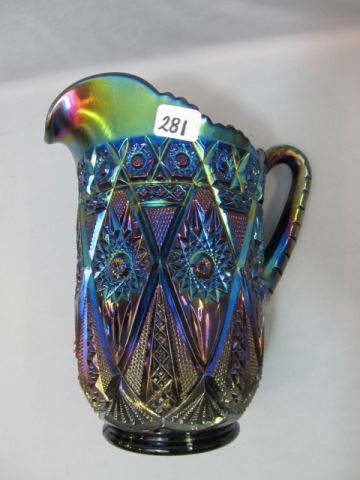 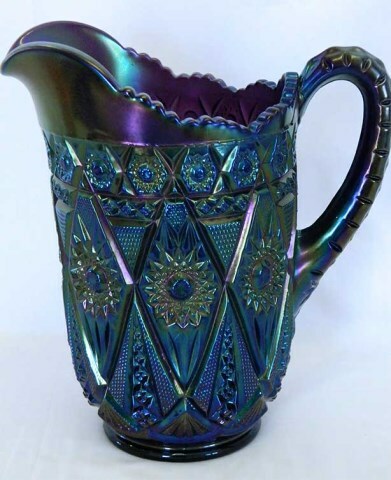 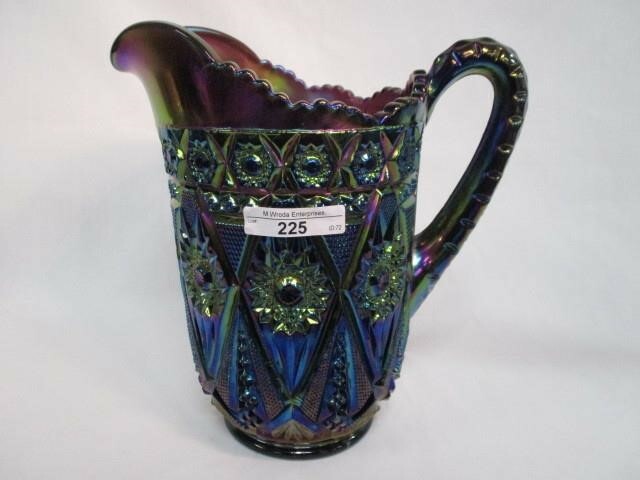 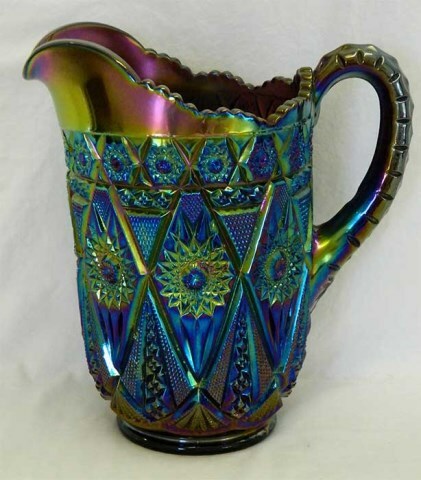 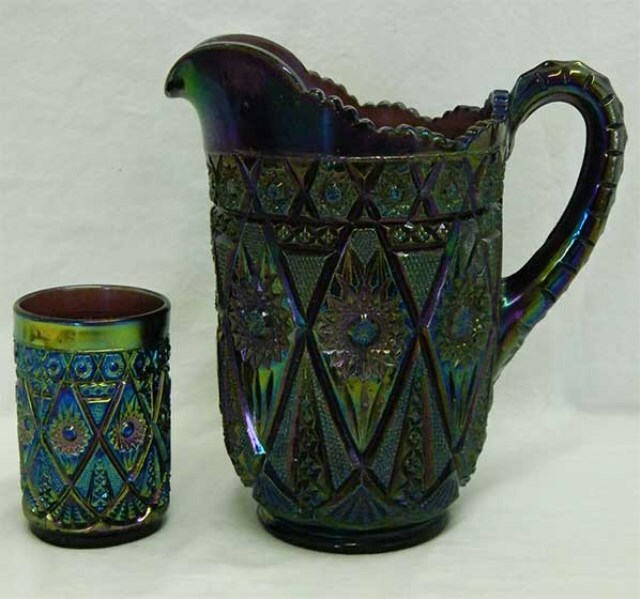 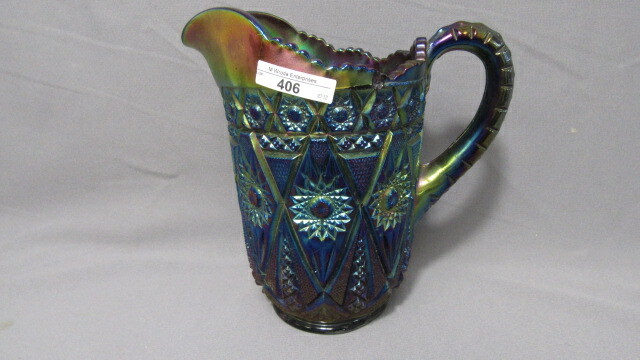 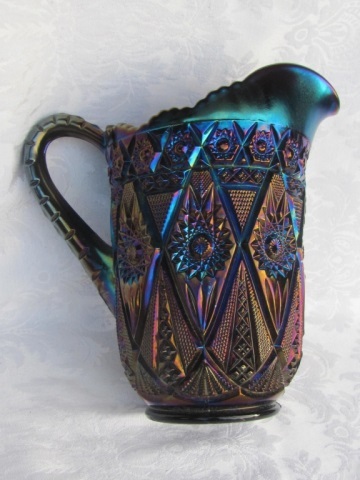 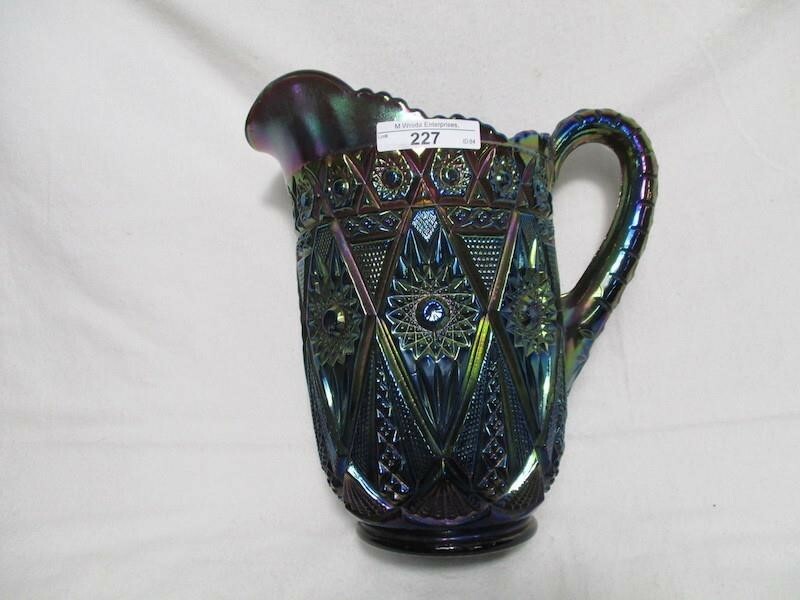 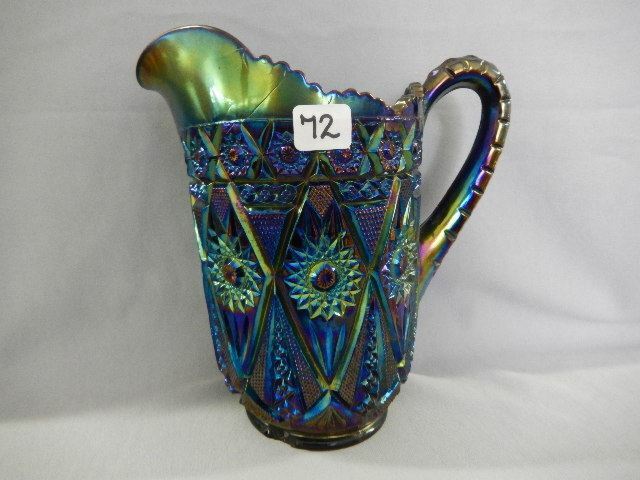 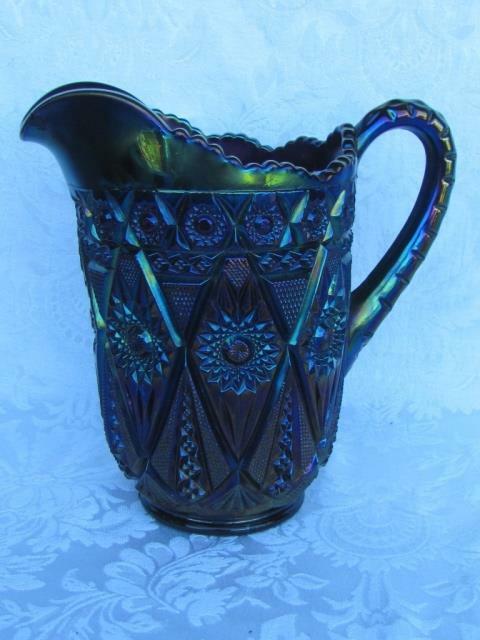 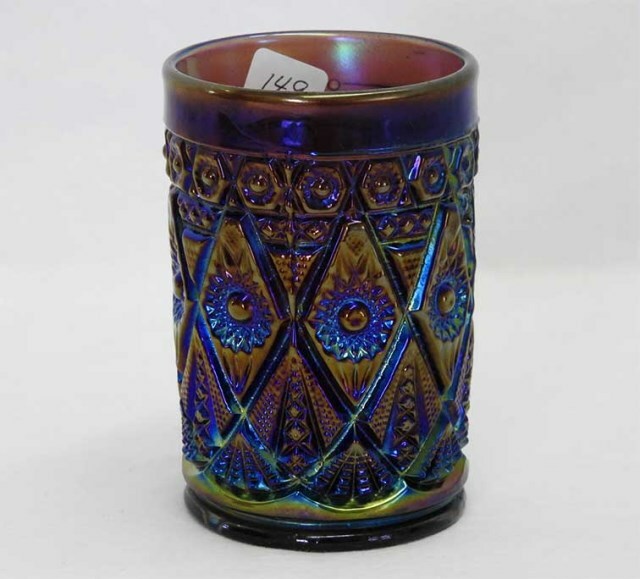 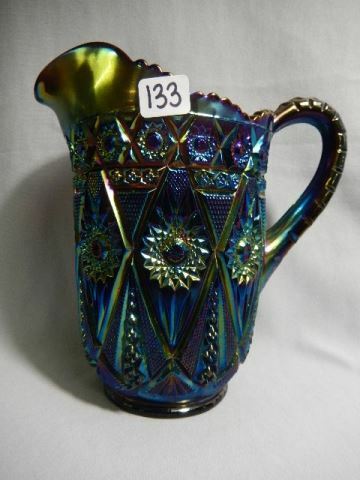 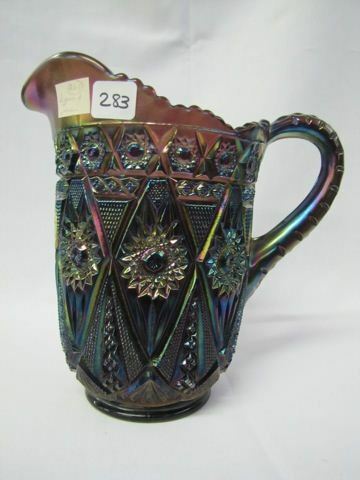 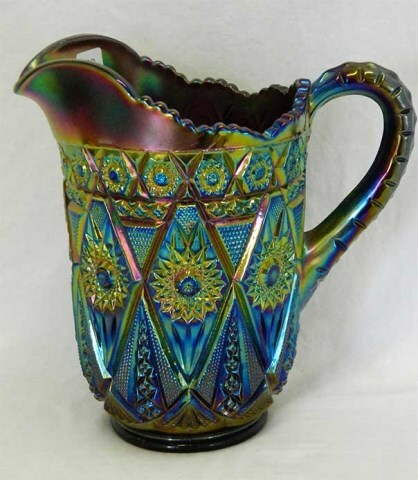 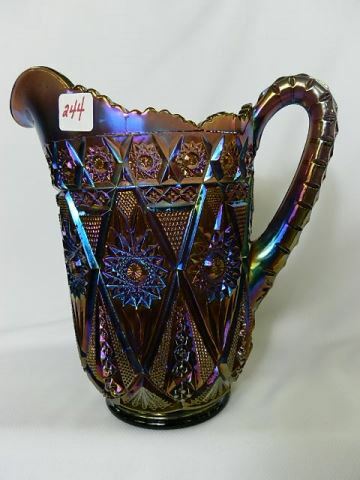 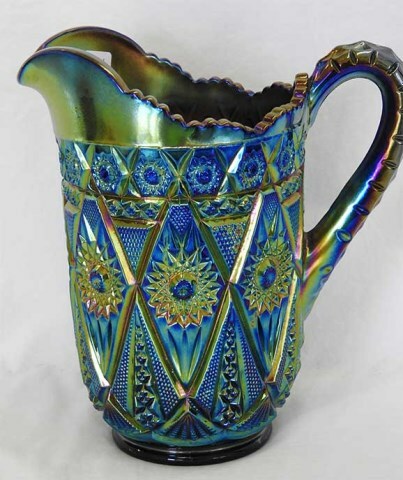 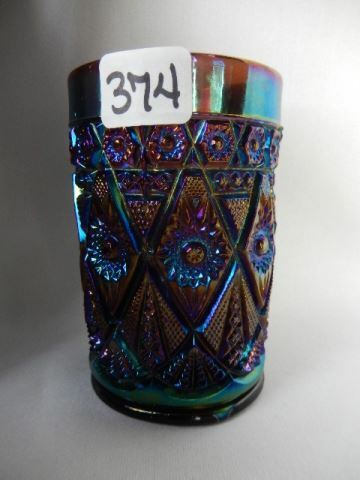 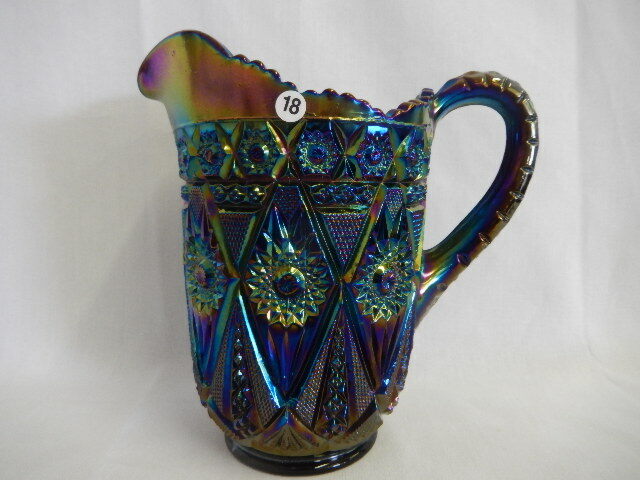 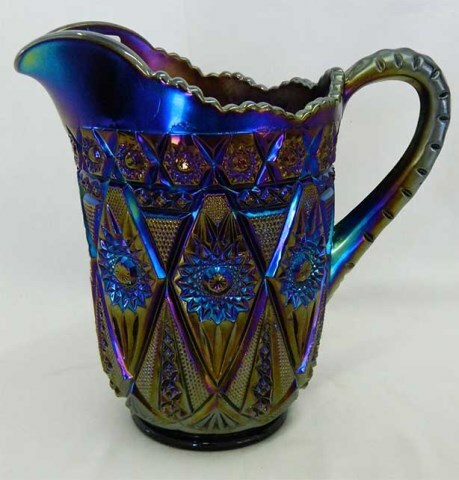 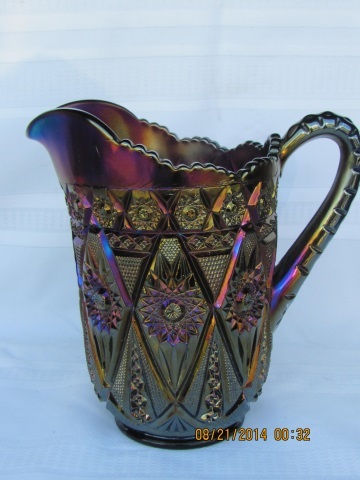 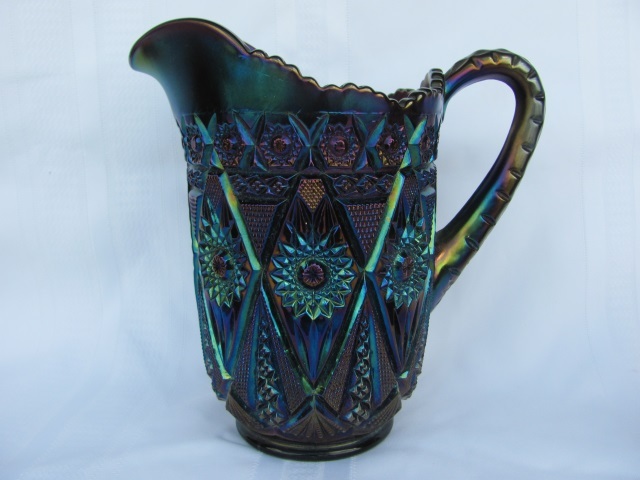 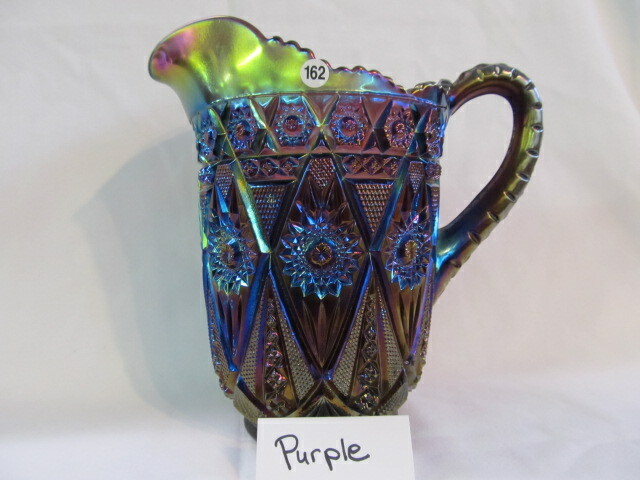 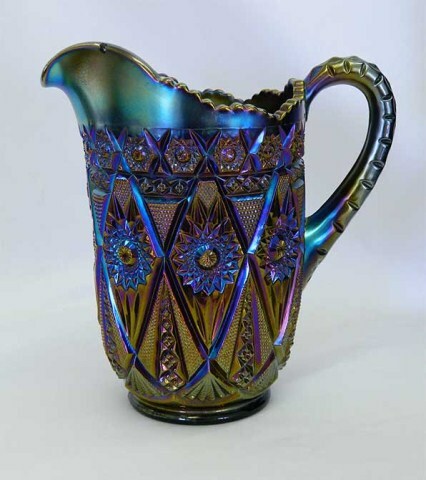 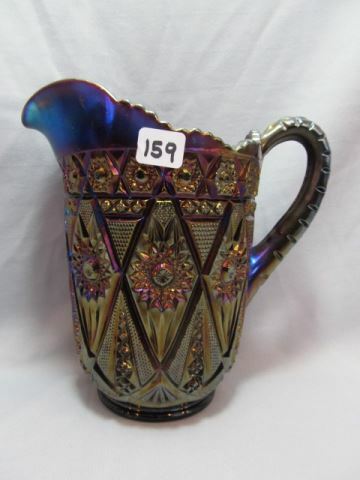 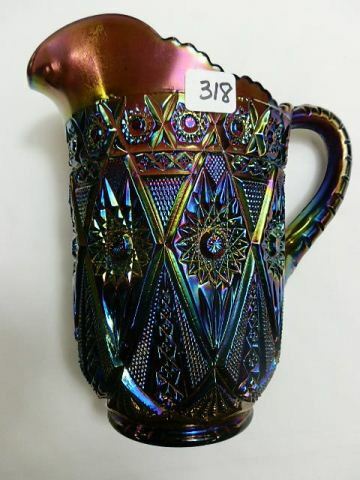 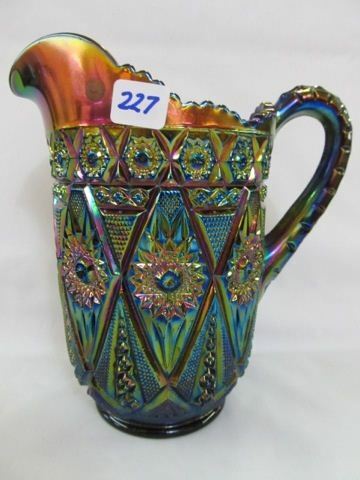 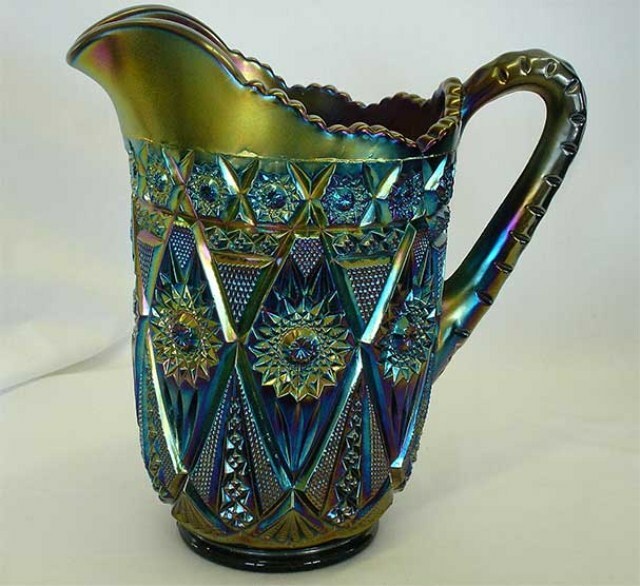 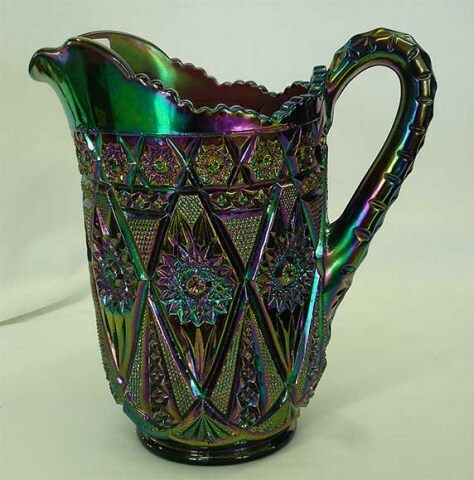 Usually exhibiting spectacular color and iridescence, the purple pitcher or water set is seen quite often at a fair price and can form the basis of an excellent collection. 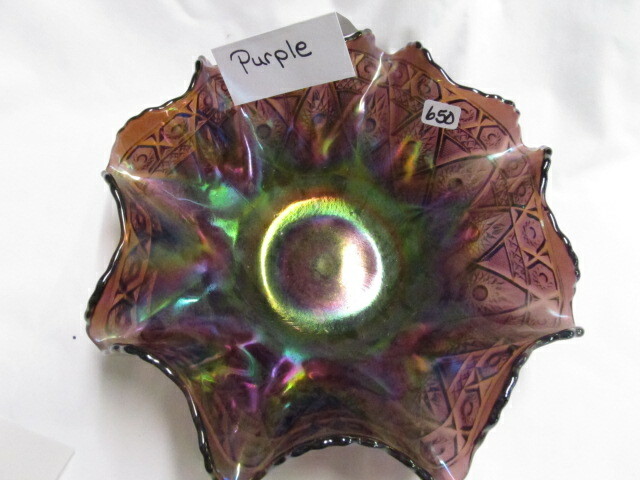 One of the few patterns in which purple is common and marigold rare. 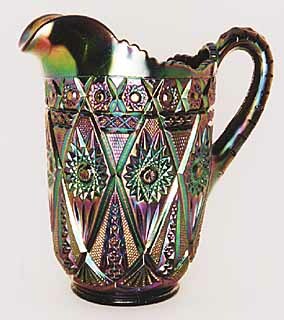 No marigold pitchers are known and only a few marigold tumblers exist. 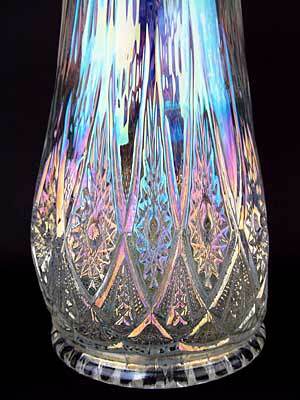 The tumbler above is courtesy of Betty Cloud. 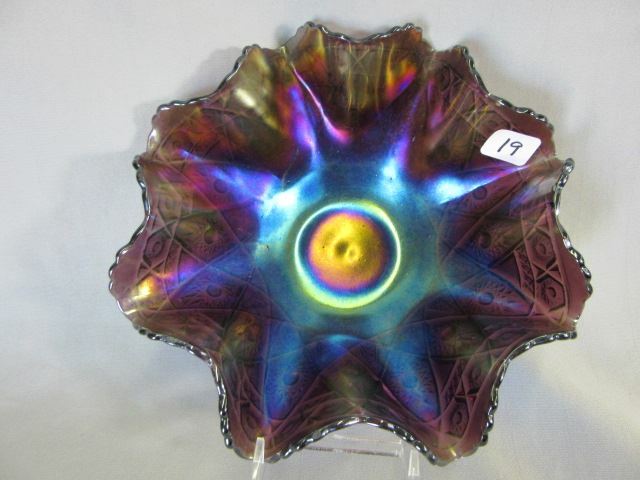 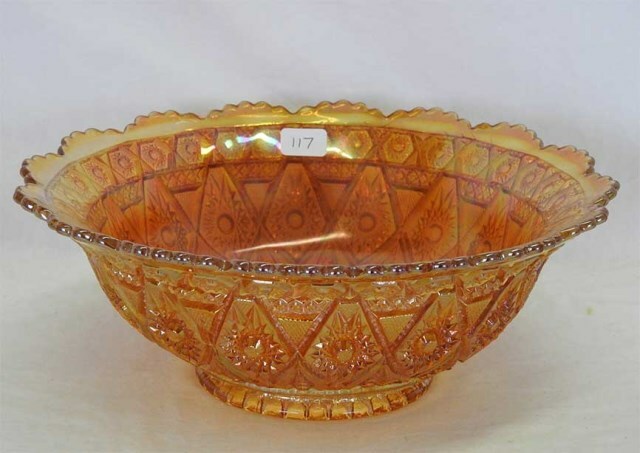 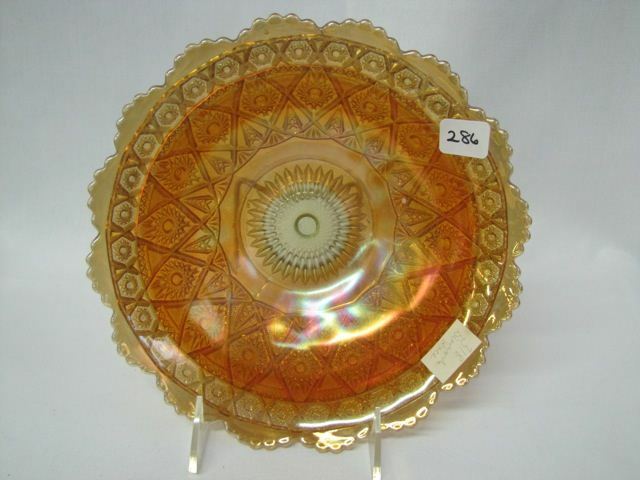 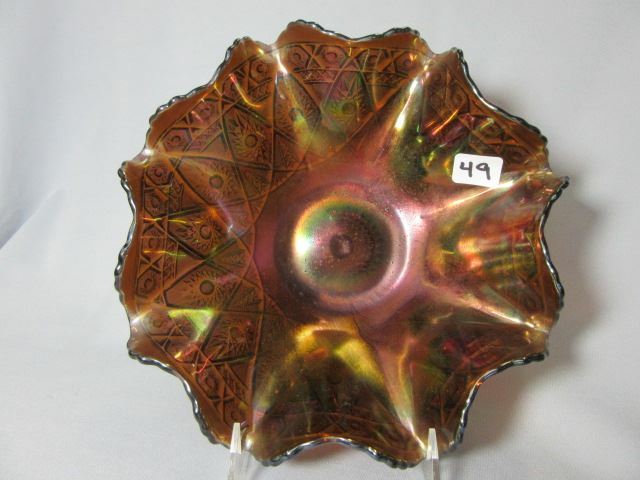 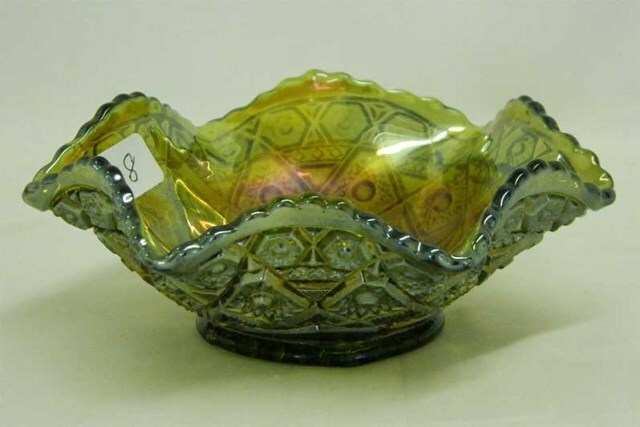 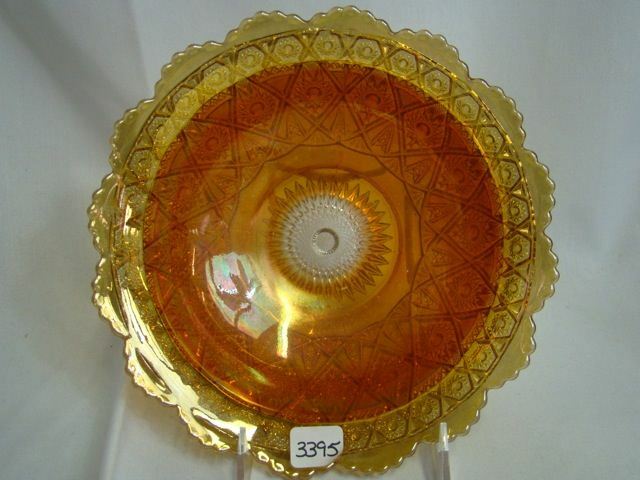 This marigold rosebowl whimsey, made from a tumbler, sold in 1995 for $1,850 (with a heat check in the base). 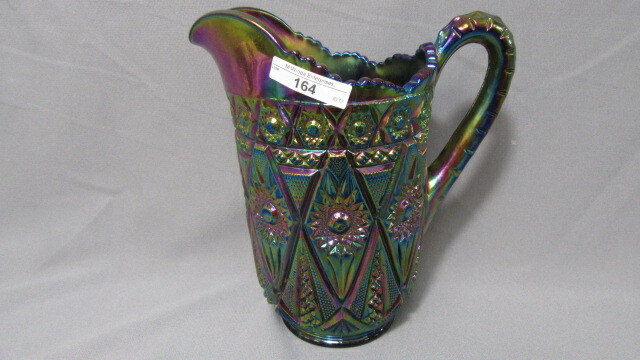 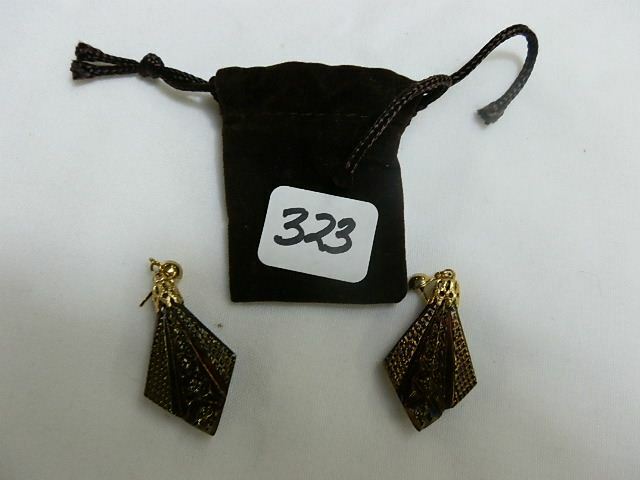 It sold again in 2003 for $1,100. 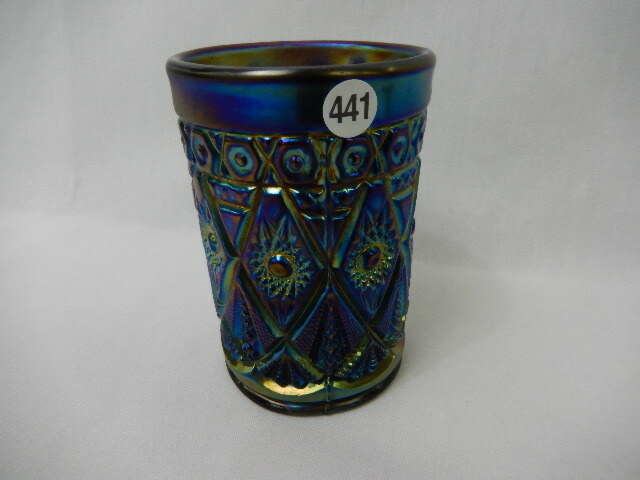 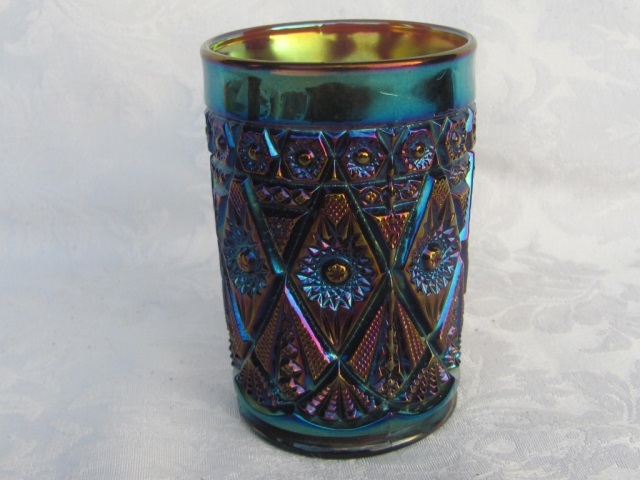 The tumbler is the variant, with no collar base. 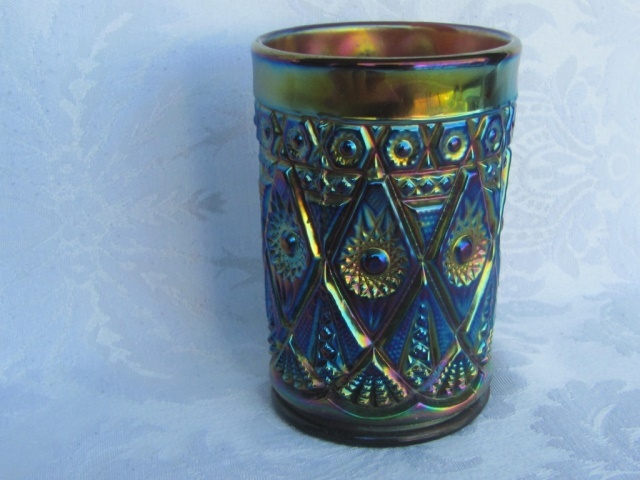 The regular tumblers have a collar base. 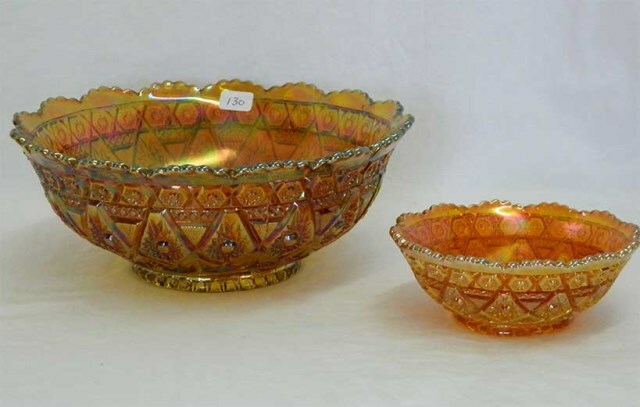 Because the pattern is only on the exterior of the bowls, they seldom bring much of a price, even though they are relatively scarce. 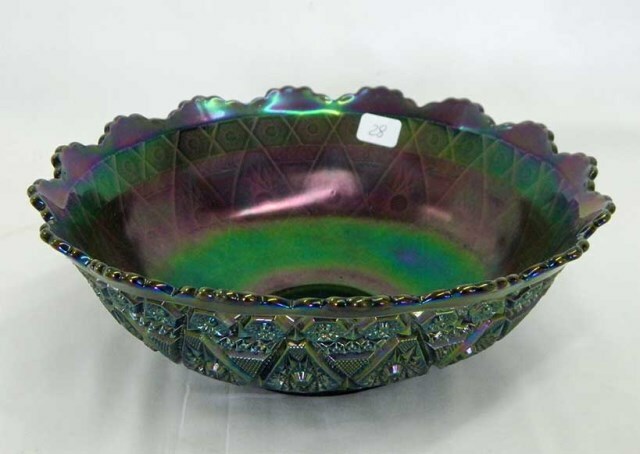 Large green bowls are quite hard to find and bring a better price. 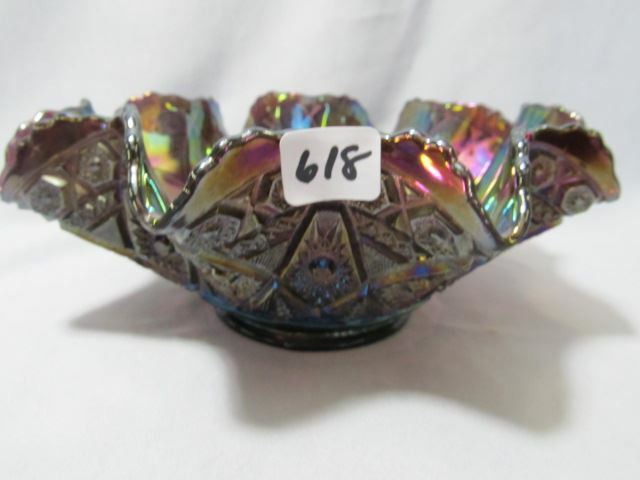 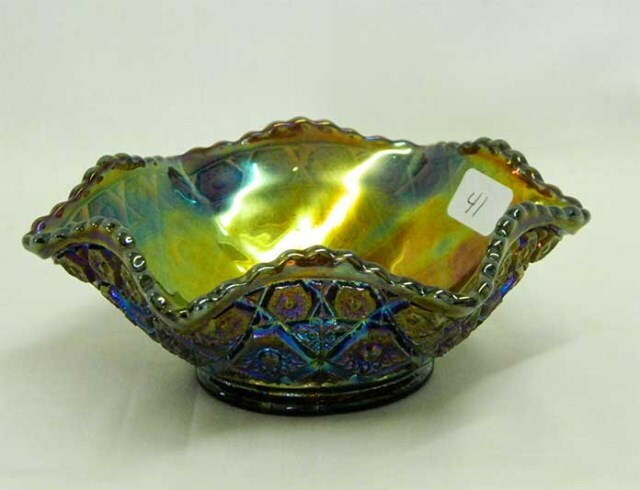 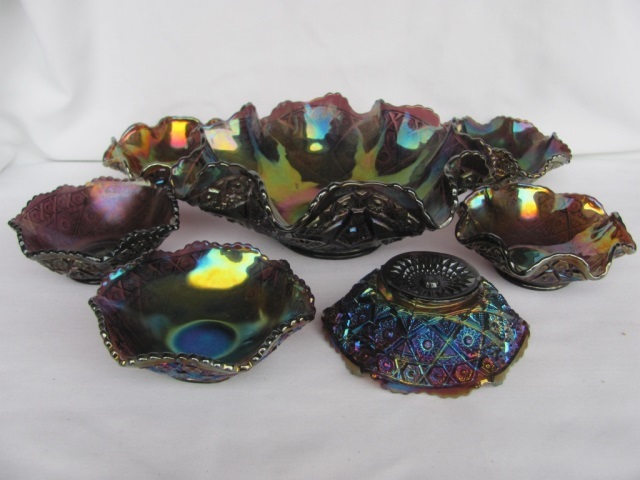 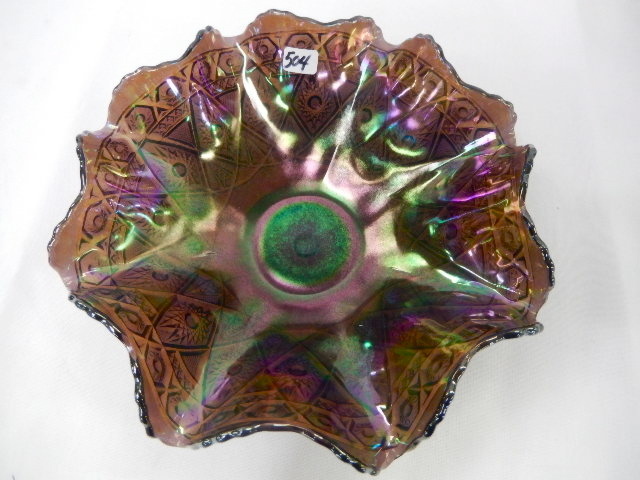 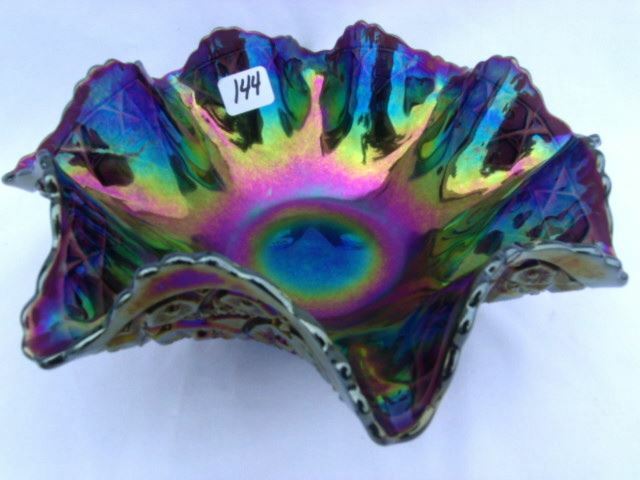 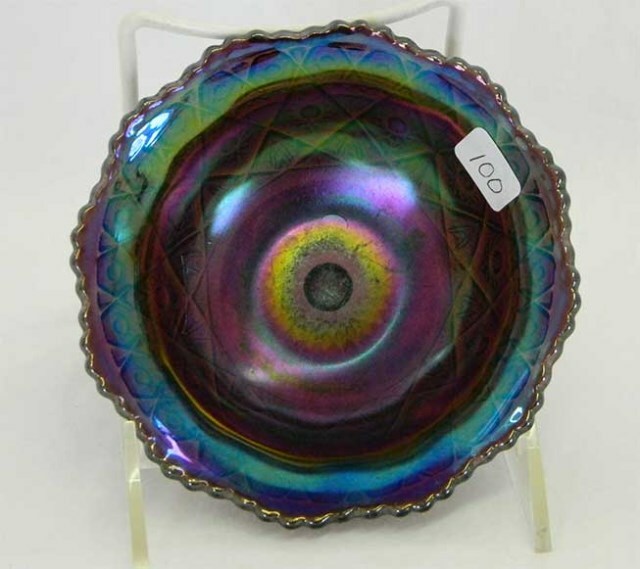 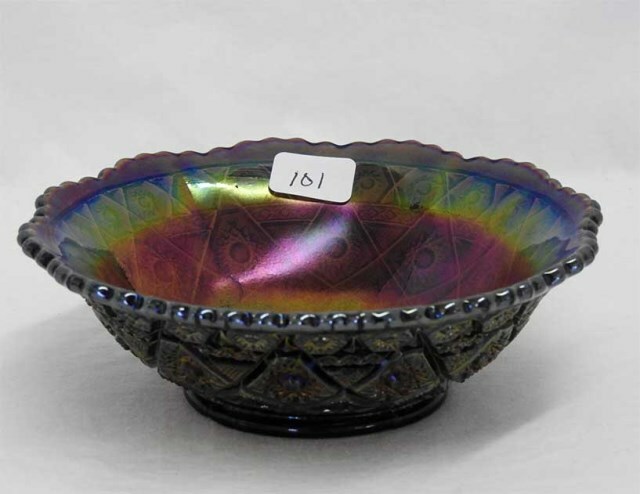 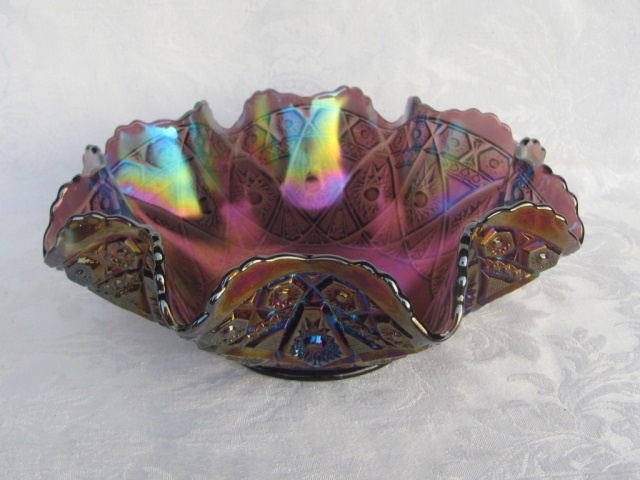 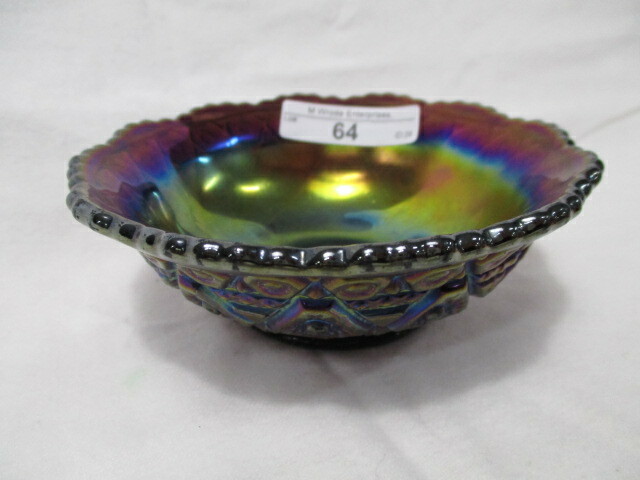 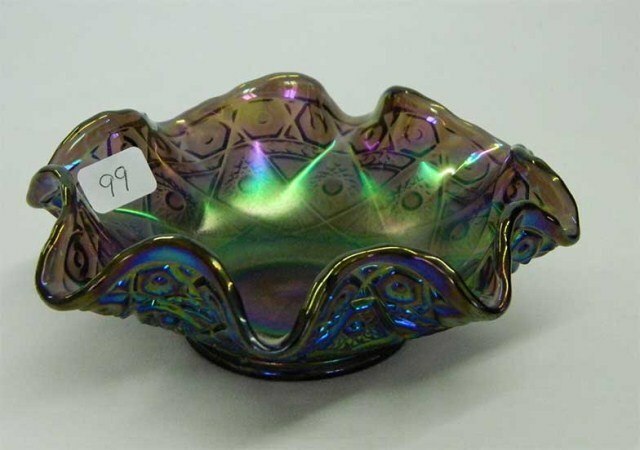 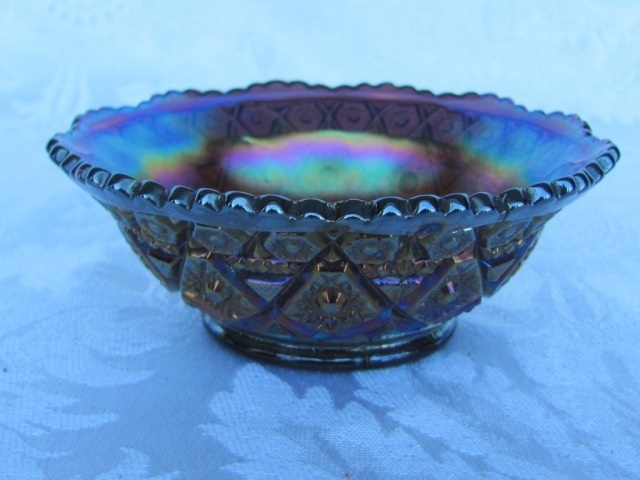 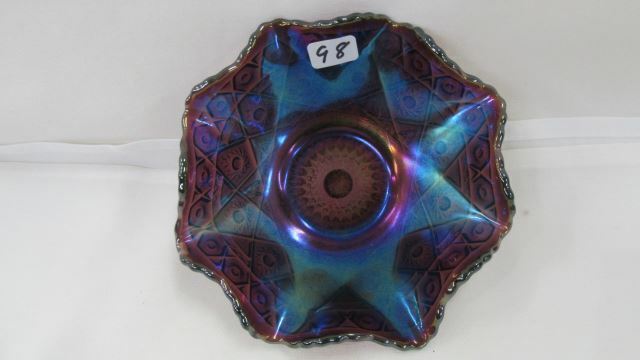 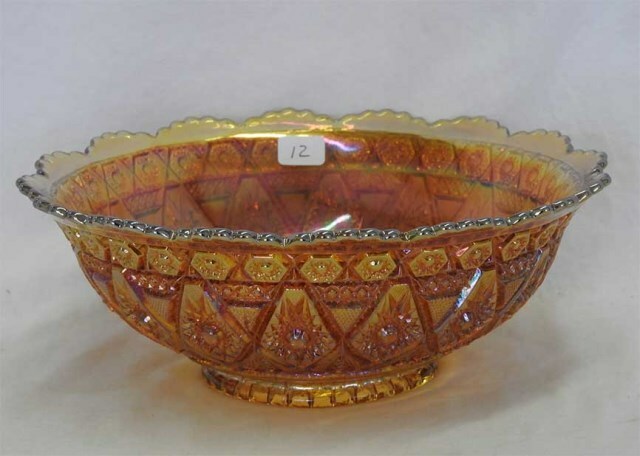 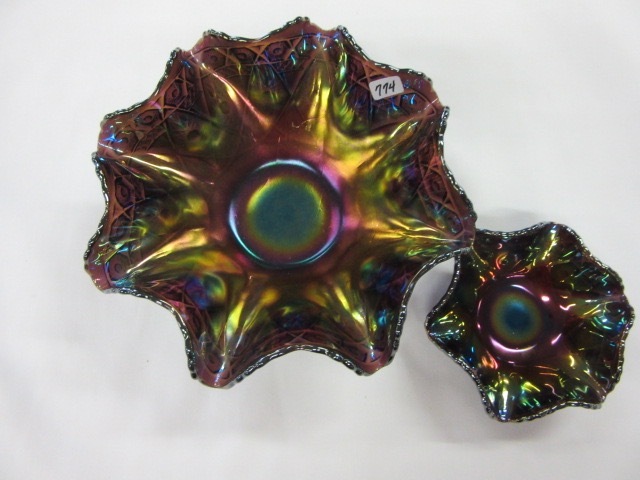 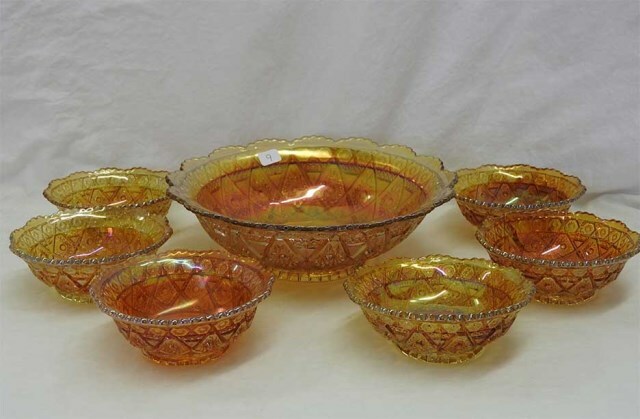 There are reissued Diamond Lace bowls and rose bowls in amethyst, blue, and red with IG or Smith markings but some are not marked, so beware. 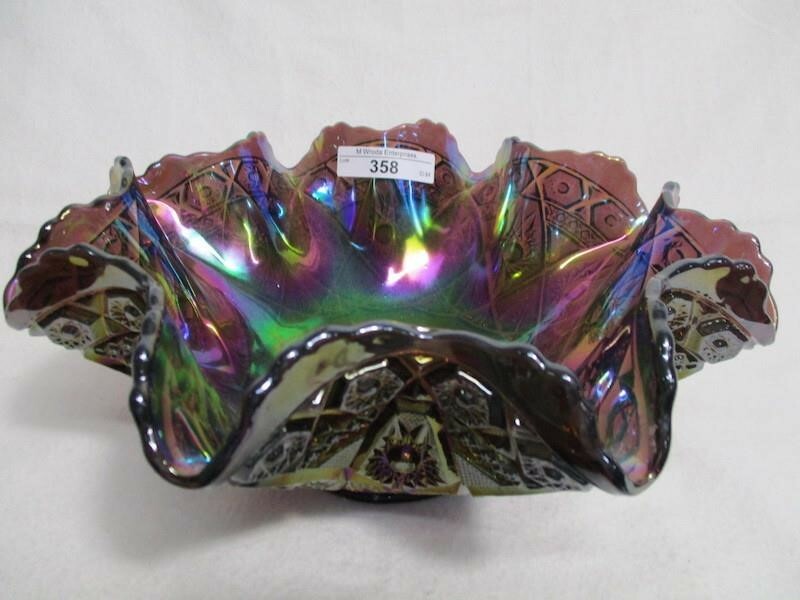 Above is a spectacular whimsey vase in white made from a bowl with a 4-inch base. 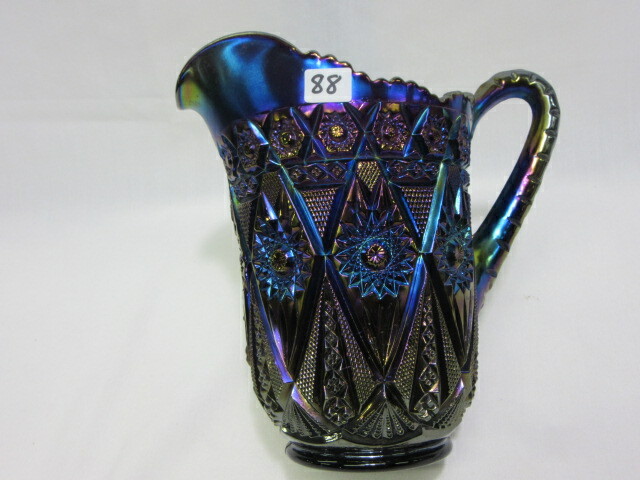 It measures 13 inches at the tallest, and 7 inches at the front. 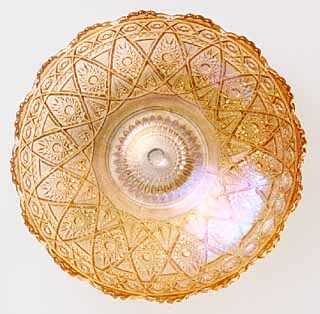 Never heard of another like it, in fact have never even heard of a piece of Diamond Lace in white. 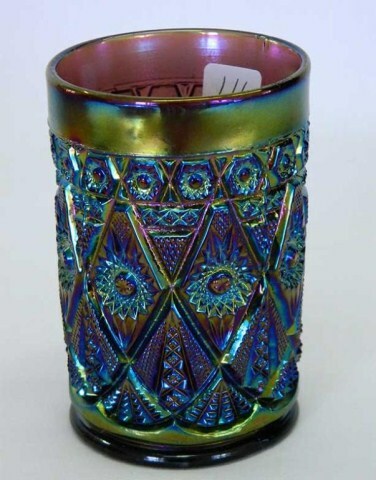 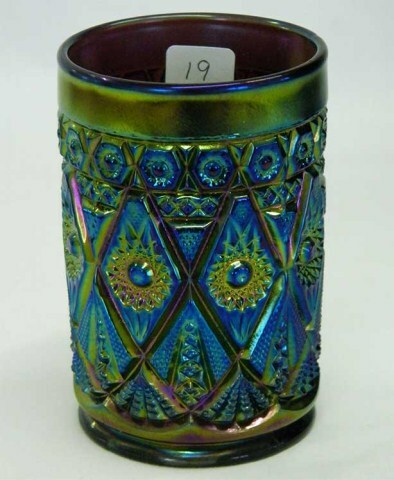 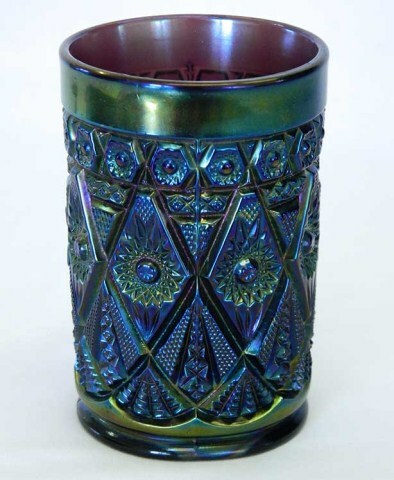 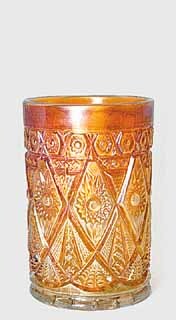 And for good reason, as this vase was made by Smith, so is contemporary. 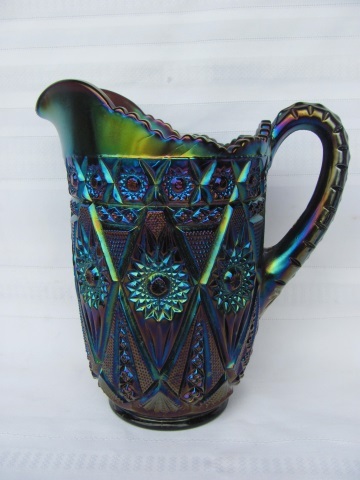 Many thanks to King Hoppel who sent me the photos in 2013. 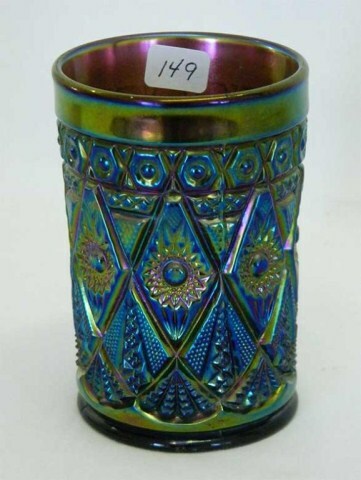 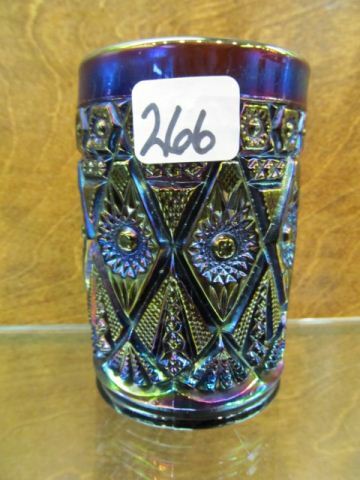 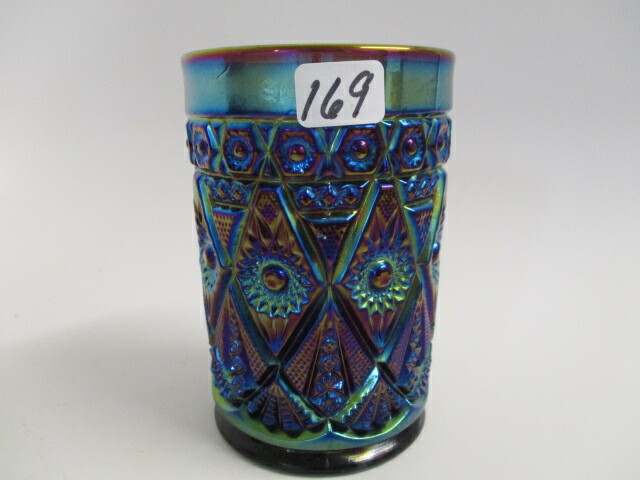 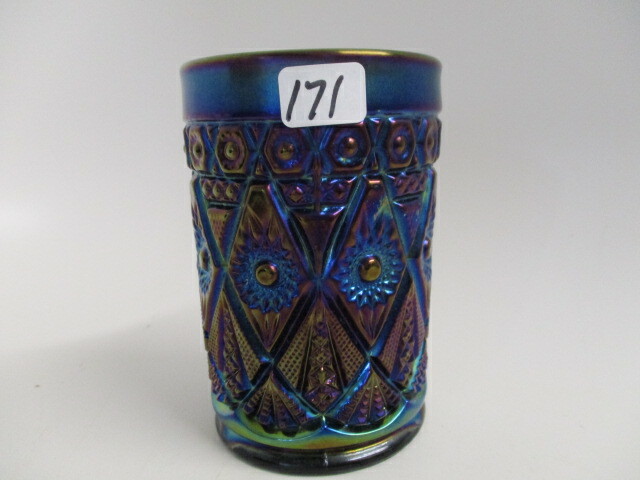 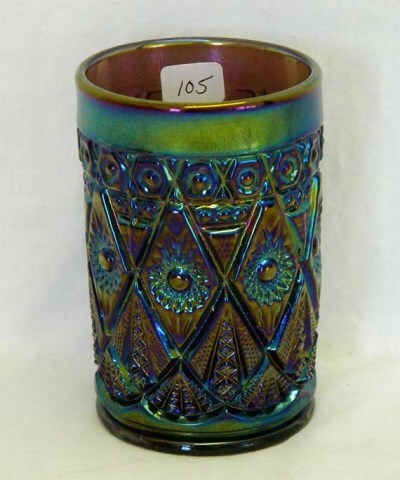 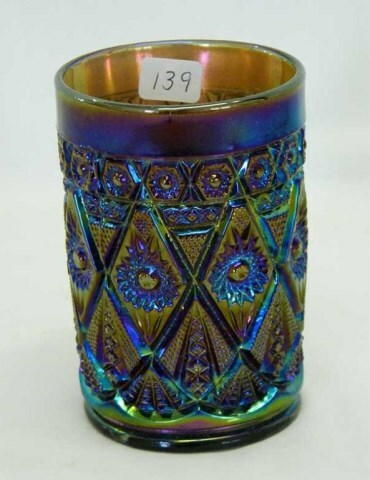 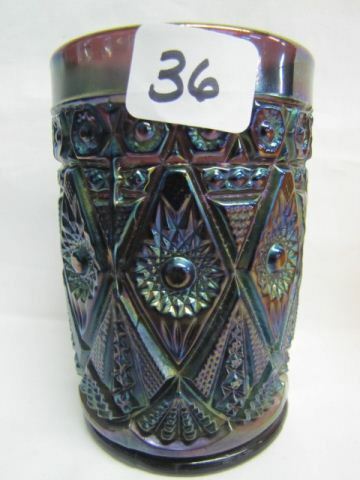 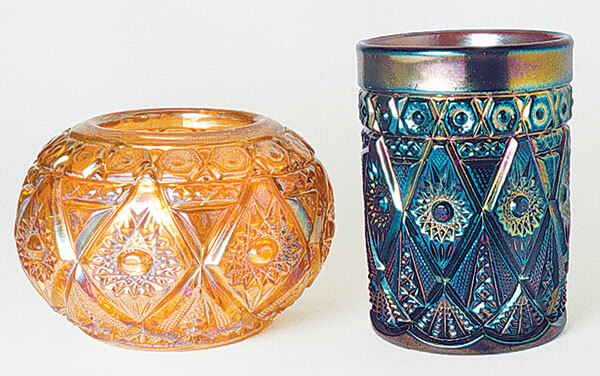 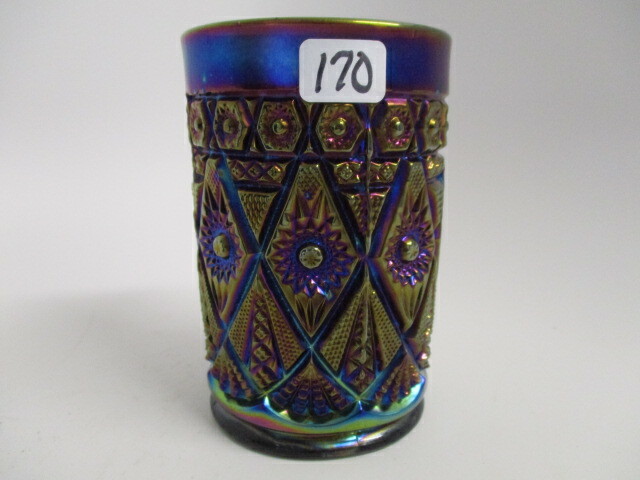 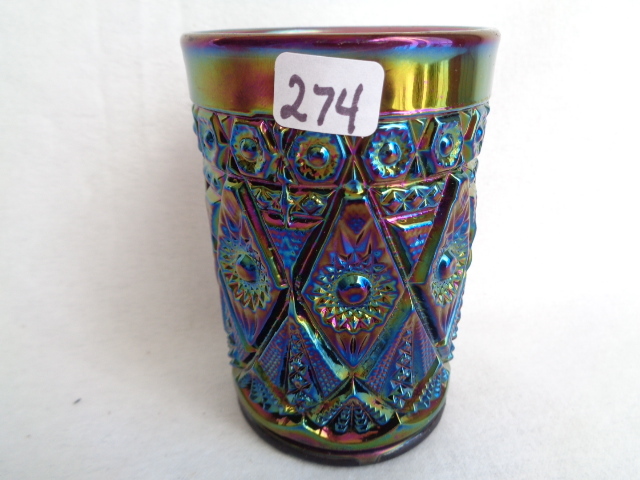 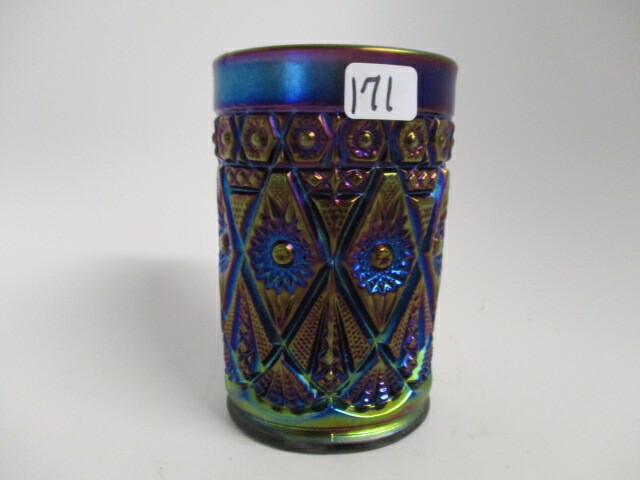 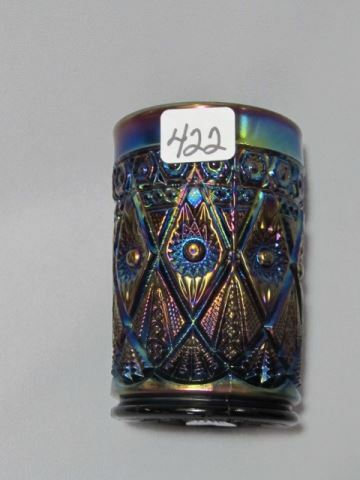 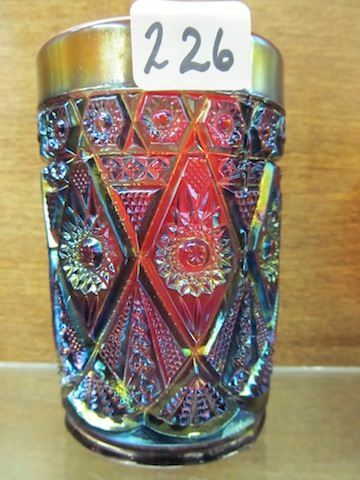 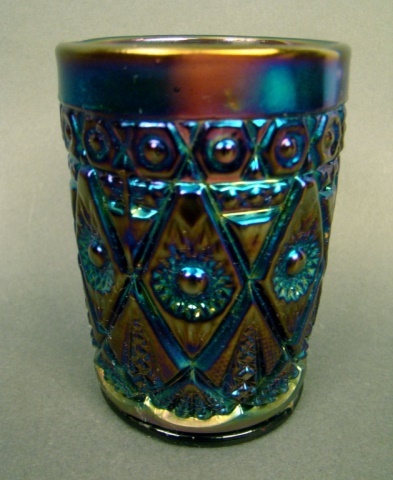 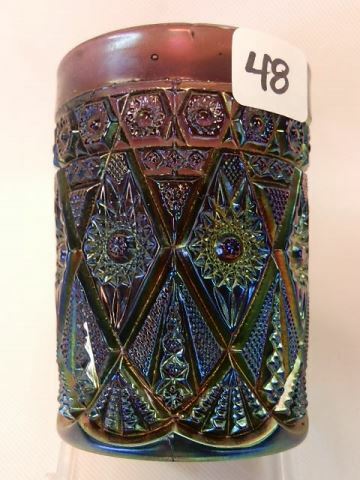 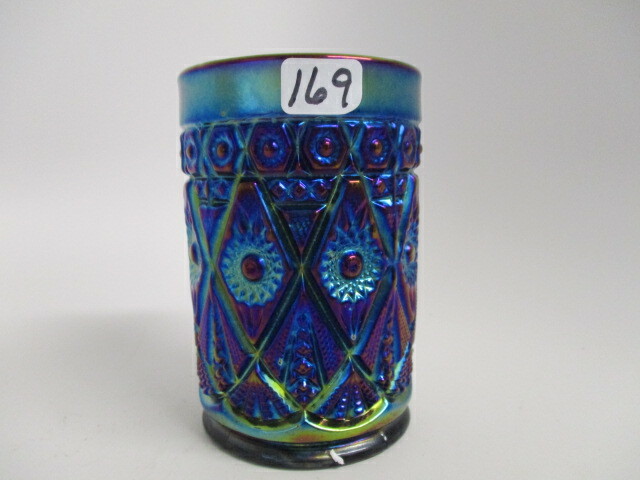 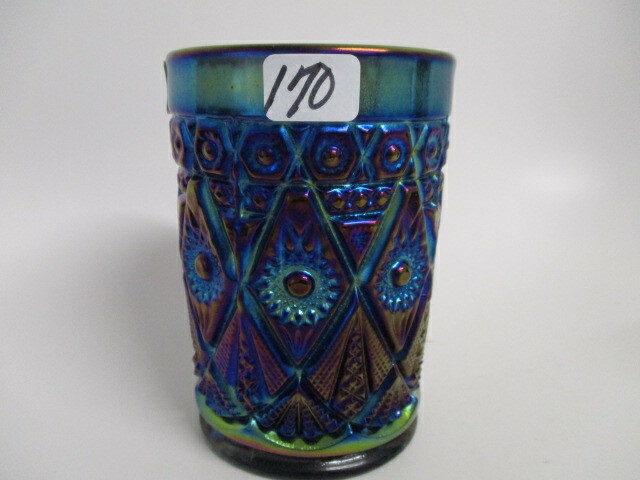 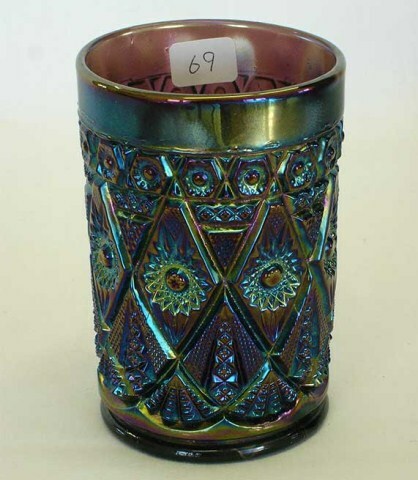 In 2015, Stan Racobprslo Sr. also send in a photo of a similar vase (which did not have the “S” mark). 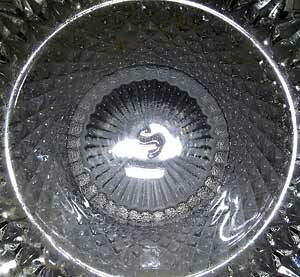 Here is a photo of the base showing the Smith “S” logo.